I know there is nothing very poetic about garbage cans or compost, but in thinking about the tons of kitchen waste that goes to land fills in plastic bags, to be mummified in the ground for who knows how long, it seemed worth writing about nevertheless. I discovered a few years ago that you can use a garbage can to compost your kitchen scraps. I have a tree rat population that was being fed by my compost pile and I needed to make kitchen scraps less accessible to them. It starts with a simple container on the kitchen counter. When that is full of food scraps (about once a week for me), it gets emptied into a 5 gallon bucket in the laundry room. The bucket has a fitted lid. One of the keys to making this all work as well as it does is to layer the kitchen scraps with used toilet paper. Keep a basket in the bathroom that all urine-wipe toilet paper goes into. If there are no women or girls in your household shredded paper might work as well. The toilet paper not only provides a small amount of high nitrogen urine, but soaks up excess moisture from the kitchen scraps. 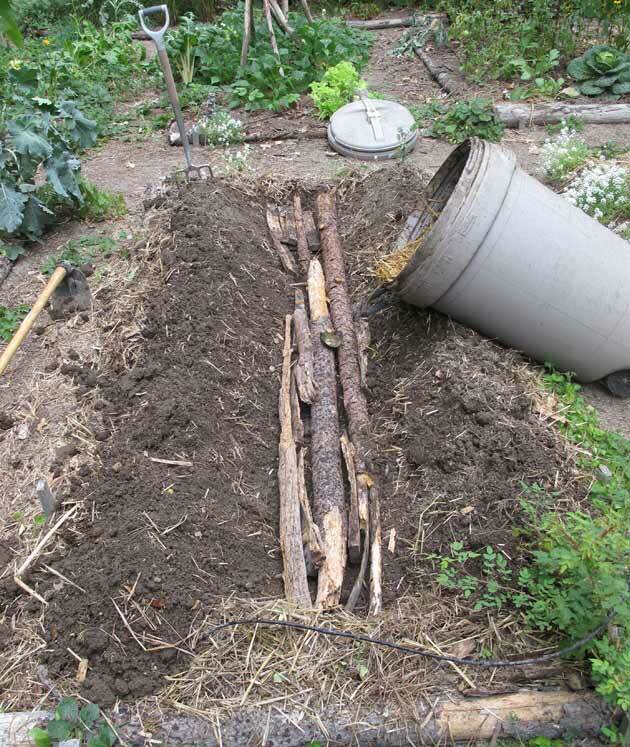 The combination begins the composting process nicely – layered dry and wet. It takes me about 6 weeks or so to fill the 5 gal. bucket – but I am a one person household, and because I pick many of my vegetables right from the garden I don’t have a huge amount of waste material. I also feed a lot to the chickens. So this is going to be very variable depending on the size of your household and your kitchen scrap “style”. When the 5 gal. bucket is full it gets emptied into a 55 gal. plastic garbage can that is kept next to the potting shed in the garden. Ours has a twist-on lid that makes it really hard for a determined raccoon or other creature to get into it. It also has a set of wheels which makes it easier to haul out to the garden when it is full – which happens about twice a year here. Each bucket load from the house gets dumped in the garbage can and covered well with straw or leaves. If you have no straw around you could save a couple big bags of leaves this fall to use all year as layering material in your garbage can. Or get some from a neighbor who has a tree. Just so you understand, this system is simply to compost kitchen waste, not garden waste; weeds, dead plants, prunings, etc. For that I have several large informal piles that compost slowly over time. It can take a long time to fill the can because it keeps “cooking” down as bacteria changes its composition, creating a smaller more dense mass over time. About twice a year – I haul it out to the garden. I time it to coincide with having an entirely empty bed – which doesn’t happen all that often. A 15”- 18” trench is dug down the middle, and the can is rolled along and emptied into it. Then we cover the spread out compost with the soil from the trench. I will often plant the bed right away (since I just seem to abhor empty space in the garden!). I have noticed that the beds that get the “garbage can compost” always grow abundant crops. Such a win-win situation! 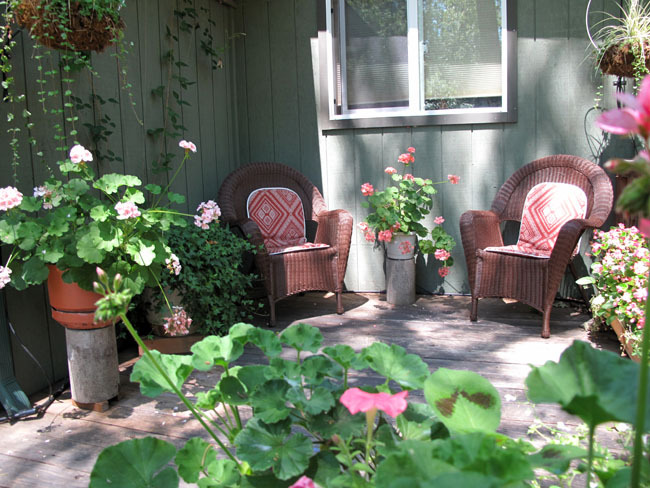 I have a simple, tidy, odor-free, rodent-free compost system – one that could work for the smallest of places – and an amazing fertilizer for my garden as well! You don’t need special skills or equipment – just the garbage can and the 5 gallon bucket with a lid. It all makes for a pretty simple system that would be adaptable to many situations. If you haven’t the room or place for a compost bin this may be an answer to what to do with your kitchen scraps. I hate to think of all that good stuff going to the dump to be mummified forever in a plastic bag, when it could be turned into rich soil in which to grow more food! 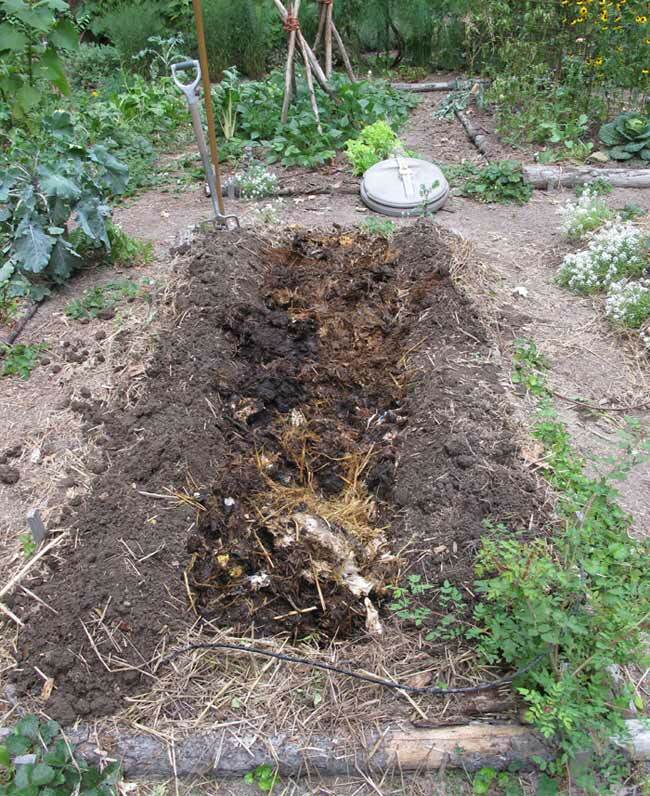 I am re-posting the two pictures from the “modified hugel bed” article because it shows the garbage can and the compost from it. This particular bed also got some rotting logs on the bottom. Great ideas! I’m doing something similar, but instead of using a garbage can converted an old box spring frame/wire mesh sheeting to hold my compost. As it finishes, it is being planted as a vertical planter. So far so good and the lower levels of kale and forage peas are growing well. Oh! What a good idea. Vertical gardening is such a great use of space! Thanks for sharing the bed frame idea… I love it! I use a similar system but not as complete as yours. I use a 5 ga bucket to collect kitchen scraps and then haul it out to a large compost bin. This system certainly has drawbacks, as one eventually has to deal with very large and heavy amounts of compost. I do like the the bucket system because the food scraps break down and ferment while waiting for a new home. You have simplified the process with your method. Thanks for information.